Chatelaine vs. The Dorian For those of you who are not familiar with the various communities in Playa Vista, Chatelaine (built in 2004) and The Dorian (built in 2008) are touted as the most prestigious condominium buildings within Playa Vista. Amenities in both communities include: concierge service, spacious and elegant floorplans (smallest floorplan start at 1600 SF), club room, and a host of other unique amenities. The main difference between both buildings are: Chatelaine has its own private pool & spa; The Dorian has a fitness center in lieu of the pool (that has been replaced by a dramatic fountain in the courtyard). Both buildings each have 45 units. 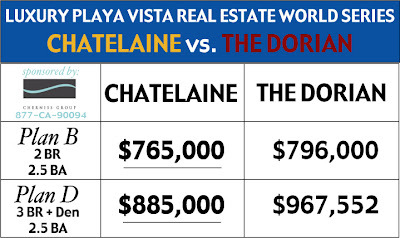 The scoreboard above illustrates current plans available for sale in Chatelaine compared with starting prices available for sale at The Dorian. Plan B is the only townhouse style (two levels) condominium for both buildings. The square footage is approximately 1800 SF. It features a large kitchen with nook area, both have built-in stainless steel KitchenAid Architect Series appliances (obviously, one's the newer model). Plan D has 3 bedrooms + den, 2.5 bath, over 2100 SF, single-level (no stairs) condominium. 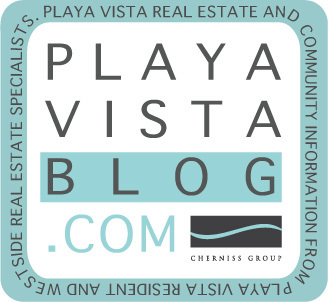 If you have been house hunting around Playa Vista, you may be aware that most residences over 1600 SF are two to three-levels. There are only four plan Ds available for each building. Both buildings are built by Standard Pacific Homes (NYSE: SPF). The residences offer a unique sense of luxury not found anywhere in Playa Vista (except in Chatelaine, or vice versa). If you're interested in finding out more information about both buildings, do not hesitate to contact us.